Kevin Ryan is stepping down after the 2015 season ends. Kevin Ryan will vacate the Antrim senior and U21 posts. KEVIN Ryan has confirmed that he will not be managing the Antrim senior hurlers in 2016 – despite having one season left to run on his current agreement. The former Waterford hurler and selector issued a statement last night in which he expressed his intention to step down as Antrim senior and U21 team manager at the conclusion of the 2015 campaign. Antrim’s interest in the Liam MacCarthy Cup competition ended in the round-robin stage of the Leinster championship and the Saffrons will compete in the Christy Ring cup next year after dropping down a grade. 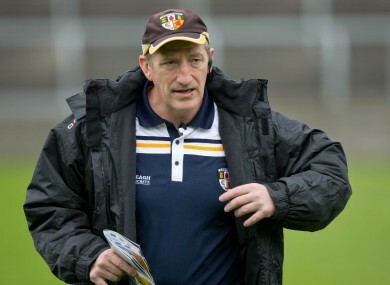 Antrim do have a Bord Gáis Energy All-Ireland U21 semi-final against Wexford on August 22 but that could be former Carlow boss Ryan’s last game in charge of an Antrim team. He stated: “When our interest in the U-21 All-Ireland series is over, I will be resigning as Antrim senior and U21 hurling manager. “Apart from early league form and a fantastic display in championship against Laois, it has been a very poor year for Antrim senior hurling. “I believe there is a vast amount of change needed to revitalise and improve Antrim hurling and it needs a clear pathway for the next three years or more. “Starting that process in my last year may not suit my successor. “It would leave players facing further uncertainty and maybe more change in 12 months time. “In the interest of all concerned I believe the timing is right for me to resign. “I hope announcing my intention now allows Antrim to find a suitable successor with ample time to prepare for 2016. “I would like to thank Frankie Quinn and the board, all those who helped and supported me in the backroom team and some seriously dedicated supporters for their support in the past three years. “In particular I would like to thank and pay tribute to the players for their continued efforts and support for both Antrim and myself. Email “This Waterford native won't be managing the Antrim hurlers next year”. Feedback on “This Waterford native won't be managing the Antrim hurlers next year”.